President Obama has lifted his arms embargo on Egypt, authorizing the deliveries of US weapons valued at over $1.3 billion, suspended after the 2013 military coup. 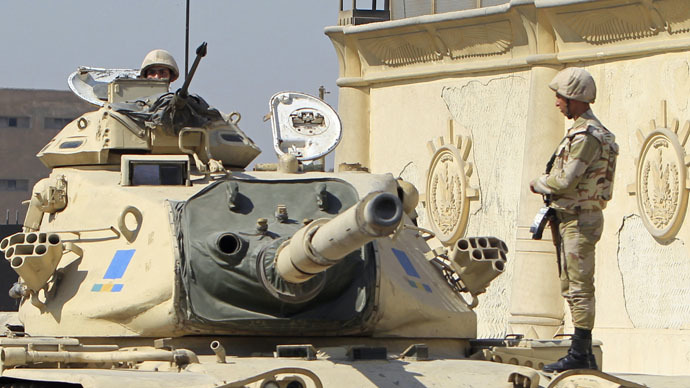 Egyptian forces have been fighting Islamic militants in Yemen and Libya. Among the weapons systems released are twelve F-16 aircraft, 20 “Harpoon” anti-ship missiles, and 125 upgrade kits for US-made M1A1 Abrams tanks in Egyptian service. The “executive hold” on weapons deliveries was imposed after the military overthrew the Muslim Brotherhood government of President Mohamed Morsi in October 2013. Egypt is the second-largest recipient of US military aid in the world. In a telephone call on Tuesday, Obama told Egyptian President Abdelfattah al-Sisi that the annual military aid amounting to $1.3 billion would continue, but that Washington wanted to “modernize” it by ending sales of military equipment on credit starting in the fiscal year 2018. Future US aid would be directed towards counterterrorism equipment, border security, maritime security and operations against militants in the Sinai Peninsula, as well as maintaining weapons Egypt is already using, the White House said in a statement. “In this way, we will ensure that US funding is being used to promote shared objectives in the region, including a secure and stable Egypt and the defeat of terrorist organizations,” Bernadette Meehan, spokeswoman for the White House National Security Council, said in a statement. “The United States has had a decades-long strategic relationship with Egypt. Since the August 2013 Egyptian government crackdown, we have made clear our commitment to simultaneously pursuing our security interests and our support for meaningful Egyptian political reform,” added Meehan. Obama also “reiterated US concerns about Egypt’s continued imprisonment of non-violent activists and mass trials” and “encouraged increased respect for freedom of speech and assembly,” the White House statement said, adding that the resumption of military aid was not a certification that Egypt has made progress toward democracy. Egyptian air force bombed targets in eastern Libya in February, after militants proclaiming allegiance to the Islamic State (IS, formerly ISIS/ISIL) beheaded 21 captured Egyptian Christians who were in the country as guest-workers. Egyptian forces are also taking part in the operation “Decisive Storm,” started last week by Saudi Arabia against the Houthi rebels in Yemen.